The iGEM community page lets you see what some of your fellow iGEM Teams are up to throughout the iGEM season! You can submit requests to post information on this page using the contact form below. Please include "Community Post" in the subject line. On 23rd February 2018, we will once again be running the v jamboree where iGEM 2017 teams, their instructors and other synthetic biologists, scientists and engineers will peer review teams’ project write-ups live and in real time. All submissions to PLOS will be featured in the iGEM 2017 Collection, and teams will have the option to submit full research articles to PLOS ONE, a leading open access journal. You can take a look at the iGEM Collections from previous years here: 2015 and 2016. We’d love for you to be a part of this exciting project. Whether you’re an iGEM team member from 2017, an iGEM alum, a synthetic biology expert or enthusiast, or have a general interest in peer review, your input would be gratefully received. If you have any questions, don’t hesitate to contact the PLOS Collections team (collections@plos.org) and we look forward to receiving submissions, and to the realtime peer review jamboree in January. iGEM is delighted to introduce you to LabSpace. The idea for this startup originated as part of an iGEM BGU_Israel 2015 project, which was awarded the 1st Runner-Up prize in the OverGraduate section that year. Save the date to join industry leaders July 16-19, 2018 in Philadelphia, Pennsylvania, USA for the 15th Annual BIO World Congress on Industrial Biotechnology! Share the latest advances in synthetic biology, renewable chemicals, enzymes, food ingredients, biofuels and more with industry executives, government officials and academic researchers at the largest international event for industrial biotech. View highlights from the 2017 BIO World Congress here. My name is Linda and I'm creating a mini podcast series on citizen science for Science Disrupt, a science communication organisation. I'm interested in whether any iGEM teams consist of people who do NOT have a STEM background. If you (or a team you know) fit the bill, I'd love to talk to you and possibly your team. I could meet you somewhere around London for a 15 minute interview, or we could chat via Skype. This is the final call for participation for the 4th International Synthetic and Systems Biology Summer School (SSBSS 2017) on July 17-21, 2017 at the University of Cambridge, UK. Team Heidelberg are glad to host Dr. Kevin Esvelt (MIT) for a talk with the title "Gene drive evolution, localisation, and restoration" on Friday, 2nd of June at 13:15 CEST. They plan to make the talk available by a livestream on Facebook, "because we consider both, the topic gene drive evolution and the speaker Dr. Esvelt to be interesting and possibly inspiring to large parts of the iGEM community." The 4th International Workshop on Mammalian Synthetic Biology (mSBW4.0) is approaching! Submit an abstract and register today for this meeting, which will take place May 6-7, 2017 at Boston University. This signature event will include Plenaries by Drs. Paula Hammond (MIT) and Josh Fidler (MD Anderson), a distinguished set of faculty speakers, and discussions with industry and regulatory experts on synthetic biology’s path to the clinic. The BIO World Congress on Industrial Biotechnology is the largest international event for industrial biotechnology, providing a unique forum for business executives, government officials, academic researchers and industry leaders to share the latest advances in synthetic biology, renewable chemicals, enzymes, food ingredients, biofuels, and more. Next year’s conference will be held July 23-26, 2017 in Montreal, Canada. We have started a blog outlining the various laws surrounding intellectual property in SynBio and Software. Intellectual Property impacts every scientist, whether it is patenting a part, using a biobrick, or considering a new tool. Being informed in IP is a major step in being a scientists in this new integrated age of science, where science, politics, and the public intersect. See you at the Jamboree!! Team EPFL: iGEM Photo Contest! This year, the EPFL iGEM team wants you to participate in the 2016 iGEM photo contest!! If you are an iGEM team and want to introduce iGEM to the world take a picture and post it under #igemphotocontest on social media pages. The winner of this competition will receive a GIANT 4.5 kg at the GIANT Jamboree. The theme is "introduce iGEM to the world". Hello! iGEMers, we are HUST-China 2016. This year we are studying at a gene expression toolkit -- Signal Filter (for more information, see http://2016.igem.org/Team:HUST-China). In order to optimize our design to better fit the needs of iGEM teams, we hope to hear the voice from all the iGEMers who might be suffering from the problems of unstable gene expression. Your participation in our short survey would greatly aid in our research. We know surveys are not your favorite thing to do, but we have a few reasons why you should take ours! Reason 1: To help and promote the success of iGEM participants/the scientific community/humanity as a whole. Reason 2: You will earn a badge of contribution for your project (if you are currently on an iGEM team). The survey takes only a few minutes to complete, it is easy and straightforward, and your life could be ever-so-slightly improved. Win-win situation, no? A science fair hosted by the University of Sheffield and the 2016 Sheffield iGEM team. University students across the UK who are participating in iGEM, which is an international synthetic biology competition, will gather to run this event jointly. It aims to educate A-level students about synthetic biology in a hands-on manner. We are calling all Biology, Chemistry, Physics, Mathematics and other knowledge-thirsty students! Attending students would be able to witness what a student-led project is capable of achieving at university and learn synthetic biology from students who are themselves on the ground doing the research. The features of the event include stalls in the science fair that provide interactive activates and talks given by academics and iGEM teams. See you at Firth Court at 10 a.m, 14th October, 2016! You and your students are invited to participate in this year's BioBuilderClub . Our rallying cry is "all you need is a good idea and we'll teach you the engineering to bring it to life." The BioBuilderClub engages high school teams around the country who combine engineering approaches and scientific know-how to design/build/test their own project ideas. We launch with a kickoff meeting in October, support teams through monthly online group meetings, and provide a nationally recognized platform in March to exhibit projects at any stage of completion, from pitch to prototype. Last year we had teams who built a microbe to dissolve splinters, a sensor for acrylamide in fried foods, and a living solution to honeybee colony collapse. We are the only informal synthetic biology club of its kind with a commitment to high school teams in the US, running from start to finish during the academic year, and remaining affordable for all those who wish to participate. All teams, large or small, receive the BioBuilder textbook, a kit of laboratory reagents and support during the academic year from remote scientist mentors. Funding for the BioBuilderClub is provided by the BioBuilder Educational Foundation, a non-profit dedicated to authentic, engaging STEM education, and our supporting partners, Biogen and New England Biolabs. We hope you'll join us! If you can't participate in the BioBuilderClub this year, please help us spread the word by forwarding this email to other people who may be interested. Please visit our website for more information: http://biobuilderclub.org. At BioBots, we’re developing the tools necessary to design and engineer living things by building a fleet of robots, programming them with powerful software, and loading them with the ingredients of life. Founded by Penn grads, our team is comprised of daring biologists and engineers who strive to cure disease, eliminate the organ waiting list, revert climate change, and support life on other planets. We empower pioneering researchers in the field of bioprinting, tissue engineering, and materials science to bring their ideas to life, expanding our global presence to 20 countries and 5 continents in under two years. Our success has been chronicled in articles by Forbes, Inc, Fortune, FastCo, Business Insider, and TechCrunch. We’re now growing the team and looking to hire the best software, wetware and hardware engineers. Team AHUT CHINA is asking for your help to fill their questionnaire! Click here to answer their survey. 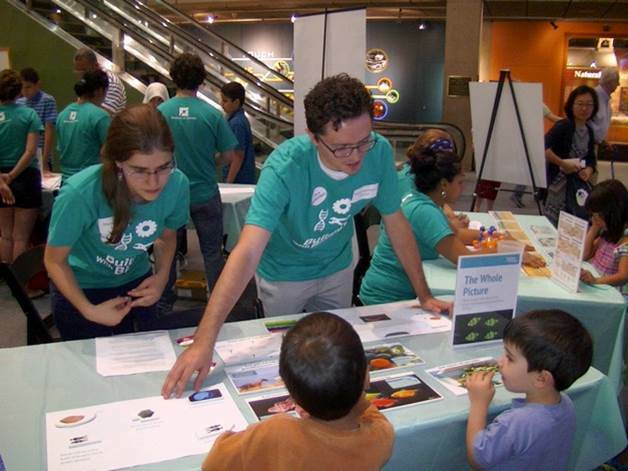 Have questions about iGEM outreach that you want answered? We’d also love to answer any questions teams may have about outreach! To have your question answered, visit http://www.thesaltschool.com/webinar and fill out the submission form. Be ready to tune in on Monday, August 15th at 12pm EST on Facebook Live! If you can’t view the webinar live, don’t worry; the entire session will be recorded and made available on the iGEM website. Details on how to tune in will be posted soon on http://www.thesaltschool.com/webinar. We’ll be answering your questions soon! Have questions about conducting an Education and Public Engagement project? Are you unsure of how to go about conducting an Education and Public Engagement project? Do you want personalized outreach guidance from former iGEM 2015 William and Mary team members? Would you like to contribute to a collaborative outreach effort? We’re proud to announce that The Salt School, a nonprofit run by two William and Mary iGEM 2015 team members who led their team’s outreach efforts, is here to help! We are working with iGEM HQ to organize an iGEM 2016 Synthetic Biology Curriculum. Your team can get help brainstorming, refining, and submitting educational activities to be added. Then, you can get help organizing workshops to run your activity! If you’re interested in running a workshop using activities from last year’s William and Mary Synthetic Biology Curriculum, we’re here to help with that as well. Visit http://www.thesaltschool.com to submit curriculum activities, ask for advice, and get one step closer to meeting the outreach requirement! In the yearly Internationally Genetically Engineered Machines (iGEM) competition, teams of Bachelor's and Master's students design and build an engineered biological system using DNA technologies. Advising an iGEM team poses unique challenges due to the inherent difficulties of mounting and completing a new biological project from scratch over the course of a single academic year; the challenges in obtaining financial and structural resources for a project that will likely not be fully realized; and conflicts between educational and competition-based goals. This article shares tips and best practices for iGEM team advisors, from two team advisors with very different experiences with the iGEM competition. This article was selected as an Editor’s Choice and made freely available. Read here! SynBioBeta SF 2016 “Fuel Your Passion for Engineering Biology"
Mark your calendars as we gear up to bring all the action back to San Francisco, this year at the South San Francisco Conference Center, for the 5th Annual SynBioBeta SF 2016. SynBioBeta SF 2016 is the prime conference for the synthetic biology industry – bringing the global community together to drive technology and business forward. Fuel your passion for engineering biology with a program full of talks from key thought-leaders, decision makers and tech pioneers. SynBioBeta is a must for those wanting to keep up with the rapidly-evolving industry. Networking opportunities amongst key industry leaders provides an environment rich for expanding your company’s reach. Make critical connections ideal for business growth or launching your next product. If you are an active part of the synthetic biology industry and have a passion for making biology easier to engineer, then this is a must attend event. As part of our human practices, the 2016 EPF Lausanne (Swizerland) iGEM team wants to create a platform, in the form of a blog or website, on which we could present iGEM teams and project through “news articles”. We think that teams know too little about what other teams are doing. This could be an opportunity to open up iGEM community and get to know teams from around the world and their project. Every week we plan to interview one team and have an article on them and their project. We thought about having a section dedicated to the best tweets of the week or the best Instagram photo. We could even collaborate with Trinity College Dublin that is working on iGEM Academy; the YouTube channel that aims to regroup iGEM teams’ videos. In order to meet this goal, we would love for teams to send us descriptions of their projects, along with pictures or videos! We hope you are excited as we are!! Hello iGEM teams from Trinity College Dublin! We’d like to welcome you to iGEM Academy. iGEM Academyaims to bring together and unify the iGEM community on YouTube. The channel provides a place where all iGEM videos can be posted and easily found (which means more views!). iGEM Academy already has many videos, including tutorials and project introductions. The aim for the future is to grow iGEM Academy, so that it will become a source of information for future iGEM teams, as well as other visitors looking to find out more about the iGEM competition and Synthetic Biology. Tutorials – If your team uses a protocol or technique, which is difficult to use, help fellow iGEMers and share it with the community. If working with a new method or technology such as CRISPR, tutorials can quickly become very popular. Tutorials could also explain the setting up of an iGEM team, the application process, recruiting members or logo design. A guide to help future iGEM teams. Teach about what matters to the iGEM community. Lab Hacks – Making life easier in the Lab. If your team has developed an ingenious trick in the lab, share it with the community! Vlogs – Casual videos that help viewers understand the iGEM experience. BioArt - Whether it’s painting in fluorescent proteins, fungal architecture or microbial textiles and clothes, flex some creative muscle and explore SynBio from a different perspective. Music/Comedy – iGEM isn’t all lab protocols and data analysis, show your team’s creativity with music videos or short films, it’s up to you! iGEM Academy is an excellent way to collaborate with other iGEM teams, which is a silver medal requirement. When you decide to collaborate, your team will be made a manager of the iGEM Academy channel, allowing you to easily upload and edit video content. For more information, contact us at igemacademy@gmail.com. We at Purdue are on a mission to foster better communication among iGEM teams across the world and are testing several platforms towards this end. We believe Discord would serve as a strong platform for this endeavor as it is easy and free to use. To participate, you can either create an account online or download the Discord app. Our server is called the iGEM Community Server and is designed to facilitate discussion between all teams, to encourage interregional collaboration, and to make it easy for teams to directly contact each other through Discord’s messaging system. The server allows both voice chat and text chat, and channels can be created for specific discussion. We would greatly appreciate it if you would participate in this experiment with us and let us know about your experience. Remember to join the iGEM Form and connect directly with the iGEM community! Nice to meet you all! We are the Alverno_CA iGEM 2016 Team. We would like to invite you to collaborate with us in an interlab environment, in which we will provide you with data from our lab on any plasmid DNA you would like to be characterized. If you are interested in our service, we ask that you please send us any plasmids. We will then test those plasmids in Caltech’s in vitro TX-TL plasmid testing system, and we will send you back the data we gather to compare with your own data. Why use TX-TL? TX-TL is a cell-free transcription translation system that allows for inexpensive and rapid prototyping of biological circuits. This is desirable as the usual method of prototyping and debugging circuits requires DNA parts to be cloned into cells, which can take a long time. With TX-TL, once all the DNA parts have been obtained, the circuit can be tested immediately, and so several circuit iterations can be tested in the time it takes to successfully clone even one circuit iteration into cells. In this respect, we would provide you with the option of acquiring in vitro data that you can use for comparison with your in vivo data. We are open to any requests you have, and any ways you would like your plasmid to be researched in our lab. If you would like to participate, here is the link to our service request form. For more information, or to contact us, please email us at alverno.iGEM@gmail.com. Thank you very much! We hope that this collaboration will be beneficial to you, and we are very excited to work together with everyone! BioBuilder2016 will be hosting a workshop @ Missouri University of Science & Technology. This three day professional development opportunity will prepare educators to bring synthetic biology and biological engineering into their classrooms and laboratories. Labs and classroom activities taught from the online www.BioBuilder.org resource and the new BioBuilder textbook published by O’Reilly. Discussion with members of the university research community. Activities that address human practice questions such as the safety, security, economics and wisdom of engineering novel biological systems. Activities that address the nuts and bolts of running a BioBuilder BioDesign Club or an iGEM team. Attendees receive a copy of the BioBuilder textbook, all workshop classroom materials in ready to use formats, lunch each day, and a certificate of completion including 45 PDPs for attending. Is your health care idea innovative enough to bring health care to a new level? Does your idea need financial or professional help? WIN a $25,000 grand prize along with international exposure to investors, grants, and industry leaders! Your innovation is the only way to WIN! The 6th U.S.–China Health Summit will be held on September 2 – 4 in Xi’an, China with a theme of “Health for All through Innovations”. As part of the Summit, the 2nd Young Health Innovators Forum seeks to support young innovators who are developing solutions to improve health for all by providing valuable networking opportunities, a $25,000 grand prize, and significant funding opportunities. The forum comprises innovation competitions in Boston and Beijing, as well as a final competition at the Summit, held in Xi’an, China. The finalists from Boston and Beijing innovation competitions will be invited to attend the Summit and will compete for the grand prizes at the final competition. Tag #GrowWithYHIF to share your thoughts about where you need help from us, and we will try our best to grow with you! Tag and Like us for a chance to win our monthly raffle to Toscanini, the best ice cream shop in town. Interested in engaging the public and getting communication skill support? In the summer of 2016, 200 science museums and other sites across the U.S. will be conducting hands-on activities and forum conversations to engage the public with synthetic biology. Funded by NSF, the Building with Biology project seeks to encourage information sharing between scientists and members of the public. If you're a student or practicing scientist in synthetic biology or a related field, sign up today to express your interest in participating at a location near you! This year we are running a pilot programme to help turn iGEM wetlab teams' ideas for software tools into reality. In previous years, iGEM software track teams have indicated they want to collaborate with wetlab teams to build tools that can be used by scientists in the lab. If you have ideas for software tools that would make a synthetic biologist's life easier, we want to help make that happen! We need you to help direct new software development projects in iGEM! Open to ALL wet lab teams! Whether you're a member of a wetlab team that has internal software development skills, or a wetlab team without any software skills, iGEM encourages you to use our new unified framework to tell your team members, other software track teams, and future teams about exactly what you want to see built. Build partnerships! The software track committee will then help you pair your great software projects with great teams, and work together to build incredible new tools for synthetic biologists. Or if you are simply building tools in your own team, using this new framework will help you document how and why you did it, so that future teams can continue your work. Participate! To participate in this program, just email the iGEM software track committee at software [AT] igem [DOT] org with your ideas. The committee will work closely with you to turn your ideas into a project that could change iGEM forever. As always, collaboration work is an enormous part of iGEM and we hope you'll take part in this special program! This year, iGEM has teamed up with Professor Ariel Lidner from the Center for Research and Interdisciplinarity (CRI) and colleagues at the University of Geneva to conduct a study that will help us learn more about the impact of participating in iGEM. See below for more details on how to participate! The iGEM program champions learning and advancement of Synthetic Biology. iGEM participants are characterized by a love of science, an interest in novel ideas, and the desire to take part in research. This year, the iGEM Foundation in collaboration with researchers from the University of Geneva, is launching a survey to address and qualify the different educational facets of participating in the iGEM competition. It will shed light on how iGEM fosters the learning and improvement of both scientific and non-scientific skills. By participating in this survey you will help to highlight the unique educational contribution of iGEM. In turn the survey results will serve all of us in gaining support for the iGEM teams in the future, both from institutions, universities and sponsors. A post-survey will be conducted in October and will be concluded after the wiki freeze. All information provided will be treated confidentially and anonymously, as specified by the Swiss Data Protection Act, 1992. All data will be shared with the iGEM community. 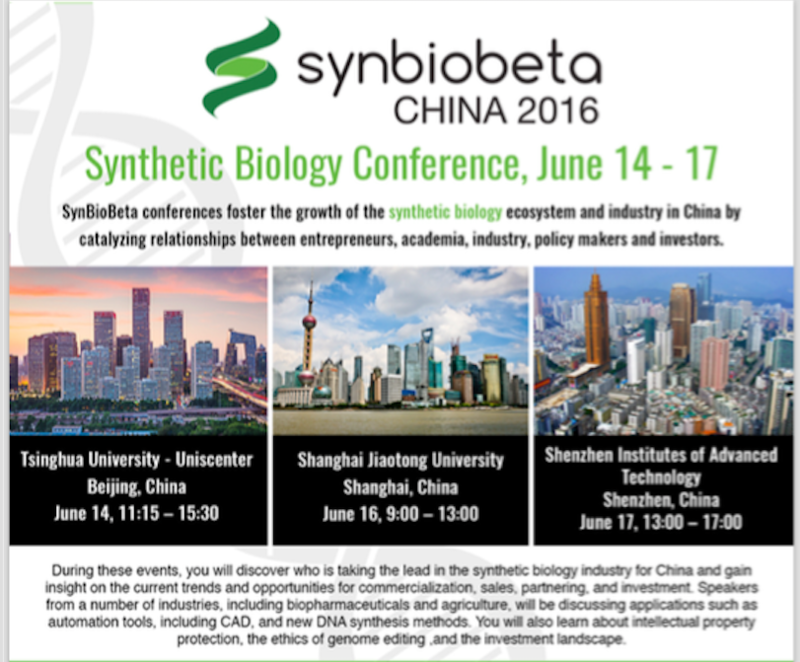 Mark your calendars for the first ever SynBioBeta Activate China. Join us as we host events in three different cities across China in one week. Hear about the latest synthetic biology industry advances, new technologies and applications. Network with industry leaders, academics, investors and entrepreneurs. Understand the current trends and learn about the growing synthetic biology market and opportunities. June 14th – SynBioBeta Activate! Beijing. June 16th – SynBioBeta Activate! Shanghai. June 17th – SynBioBeta Activate! Shenzhen. These free kits are designed to create conversations in museums among scientists and public audiences about the emerging field of synthetic biology and its societal implications. We have reserved a number of these kits to be awarded to iGEM teams. iGEM 2016 teams may find these kits helpful in meeting the iGEM Human Practices public outreach and dialogue aspects of the competition. Applications are due April 18, 2016. Only teams located in the United States are eligible to apply for a physical kit. Digital kit materials will be available for free download in June 2016. Before applying, please read the application overview; the overview includes more details about the project, eligibility requirements, project expectations, and how to apply: http://www.buildingwithbiology.org/sites/building-with-biology/files/BwB_application_overview_iGEM_teams_3-11-16.pdf. Applications must be submitted online using SurveyGizmo by April 18, 2016 for iGEM teams. Online SurveyGizmo application link: http://www.surveygizmo.com/s3/2342311/Building-with-Biology-Kit-Application. Team Korea U Seoul is considering hosting an Asia Regional Symposium in iGEM 2016, and has created a survey to help them better plan the event. If you're a team in the Asia region, please fill it out here: Google Doc survey. The instructors of the the 2016 Cold Spring Harbor Laboratory Summer Course in Synthetic Biology are excited to announce that we are accepting applications. The deadline is the 15th of April and the course takes place from the 2-15th of August, 2016. You, colleagues, and/or trainees are encouraged to apply if you are a senior graduate student to junior faculty and beyond, and starting out in synbio or interested in a multi-disciplinary approach to biology and bioengineering. We encourage students of all backgrounds, whether the very biological or very theoretical, to apply! Over the the past three years, graduate students, postdocs, industry professionals, high school STEM research leaders, and junior faculty have completed our exciting, hands-on two-week class. The Course centers around an immersive laboratory experience. Here, students will work in teams to learn the practical and theoretical underpinnings of cutting edge research in the area of Synthetic Biology. In addition, students will gain a broad overview of current applications of synthetic biology by interacting with a panel of internationally-recognized speakers from academia and industry during seminars, lab work, social activities. Several stipend awards are available for applicants who are accepted into the course. To be considered for an award, please reference which one you are eligible for in the Stipend Request section of your application. Hello everyone! Are you interested in engaging the public and getting communication skill support? In the summer of 2016, 200 science museums and other sites across the U.S. will be conducting hands-on activities and forum conversations to engage the public with synthetic biology. Funded by the National Science Foundation, the Building with Biology project seeks to encourage information sharing between scientists and members of the public. If you're a student or practicing scientist in synthetic biology or a related field, sign up today to express your interest in participating at a location near you! The deadline to apply to be a host site is February 1. Site selection for institutions to receive a free physical kit will happen over the next month. Selected sites will be notified on March 1. Physical kits will be sent out on June 1, and digital materials will be posted online around the same time. Sites will host Building with Biology events during the summer period from late June until the end of September. More information is available on the Building with Biology website. A symposium titled "Mining Microbial Diversity for Pleasure and Profit" is being organized at the Microbiology Society Conference in Liverpool, UK from March 21-24, 2016. iGEM 2015 teams from UK and Ireland are invited to attend and show their work to a wide audience. The organizers propose on Wednesday March 23 to hold a dedicated iGEM poster session and to also provide two selected iGEM teams with speaking slots in the afternoon symposium. Team members who are postgraduates would need to be/become postgraduate members of the Microbiology Society to receive waived event registration and a travel grant from the Society under the normal procedures. The official registration deadline for the conference is December 11, but iGEM team members have until Christmas to submit their materials. Instructors Adam Arkin and Ron Weiss from MIT will be leading a MOOC titled “Principles of Synthetic Biology” beginning January 4. This introductory synthetic biology course begins with a brief overview of the field and then delves into more challenging yet exciting concepts. You will learn how to design your very own biological regulatory circuits and consider ways in which you can apply these circuits to real-world problems we face today. The course runs for 14 weeks. Registration is free and open to the public. For more information, see the edX course page.